Symptoms:Symptoms include oral allergy syndrome, abdominal pain, generalised or facial urticaria, anaphylactic shock, laryngeal oedema, shortness of breath, bronchospasm, tongue angioedema (Igea et al. 1991 ; Gaig et al. 1992 ; Gaig et al. 1999 ). Fruit (Gaig et al. 1999 ; Igea et al. 1991 ). Use of the prick to prick technique (Igea et al. 1991 ; Gaig et al. 1992 ; Gaig et al. 1999 ). 1% histamine was used as positive control (Gaig et al. 1992) . Two 25-year-old women and a 3-year-old child (Gaig et al. 1999) . SPT was positive in the three patients (Gaig et al. 1999) . SPT was positive (Gaig et al. 1992) . 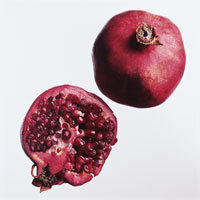 Pomegranate pulp extract (Gaig et al. 1999) . IgE protocol:RAST and immunoblotting (Gaig et al. 1999) . RAST; Positivity was accepted when it was class 2 (0.7-3.5 PRU/ml) (Gaig et al. 1992) . RAST assays were positive in 2/3 patients (3.21 and 0.75 PRU/ml) (Gaig et al. 1999) . Immunoblotting separation:Protein separation was performed using 12.5% acrylamide 1D SDS-PAGE gels. Samples were reduced with beta-mercaptoethanol (Gaig et al. 1999) . Immunoblotting detection method:Proteins were transferred to PVDF membranes in buffer. Membranes were blocked , incubated with sera (undiluted) and bound IgE detected by peroxidase conjugated rabbit antihuman IgE. Blots were developed by chemiluminescence (Gaig et al. 1999) . Each of the 3 patients reacted only with a 29 kDa protein (Gaig et al. 1999) .